Q: Where do you recommend to eat sushi? "Toyama Sushi Guide Map" created by the Toyama City Tourism Agency provides a detail information of 15 sushi restaurants around the central area of Toyama city. It also comes with a sushi-ordering guide, a terminology of sushi, and a seafood calendar. Please go to the link below for downloading the guide map for free! Q: Where do you recommend to eat local cuisine of Toyama? Asking Locals is always the best way to find a restaurant that serves a local cuisine of Toyama. However, if you would like to check out restaurants before you arrive at Toyama, we recommend you to visit these 2 websites below. You are always welcome to our information center to ask questions regarding restaurants and local foods. Q: What gifts and souvenirs do you recommend? 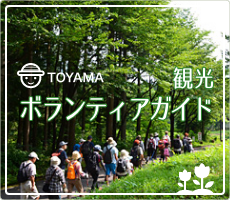 Q: Where can I buy gifts and souvenirs of Toyama? There is a building called "Kitokito Ichiba TOYA-marché" is located in the east side of the station. It provides 30 of souvenirs and gift shops and 5 of restaurants that offer a variety of local foods. Please refer to the link for more information! Q: Where are tax-free shops? the shops and a map.